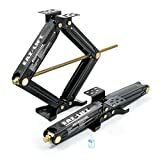 What is the Best Scissor Jack For Cars to buy? What is a Scissor Jack ? A scissor jack is a powerful mechanical tool that aids the lifting of heavy loads. It comes in handy where bare hands are not enough to lift the heavy vehicle to a raised surface for the required service. They come in two types; the manual scissor jack and the electric scissor jack. The manual model requires human workforce to carry out the entire lifting operation, while the electrically operated one relies on electric power for operation. There are different kinds of this product in the market that look similar. It is essential that one goes through several reviews to get the one to suit their problem. Without the right information, wrong choices can be made resulting in massive losses. A scissor jack offers the needed help by man when there is a heavy vehicle to be worked on. Nevertheless, not all scissor jacks are suitable for this function. Only the best is going to give you the right service. It has a screw designed to be powerful to minimize the energy required by a user to carry on with the mechanism of lifting heavy loads. The car jack arms rotate gently reducing the force needed for lifting heavy vehicles by dividing it into manageable parts. Its power screw is the base of the entire mechanism for the tool. The following are five of the best Scissor Jack for car. The Scissor Jack all have a variety of prices, as well as pros and cons for each. 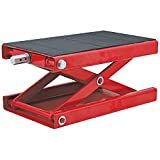 Torin Big Red Steel Scissor Jack is made using heavy-duty steel. It is a bit larger than other scissor jacks. Its size makes it impossible to be stored inside the small cubicle together with the original jack. Greasing eases its operation for the user. Its capacity, 1.5 ton makes it capable of lifting an SUV without much struggle. Has a Soft grounds lifting mechanism? RV Trailer Stabilizer Leveling Scissor Jacks come in a set of four, with each of the jacks holding 5000 lb. Their purchases save the user a massive amount of cash. Each jack has a broad base, bow-tie like, which provides the needed stability on the soft ground. It can bear an extended height of 24 inches, a retracted height of 4 inches and a width of 7.5 inches. With the power drill from the socket, turning is not part of your worries. You do not need to apply energy on that. Eaz-Lift 24″ RV Stabilizing Scissor comes in a set of two. For the best leveling services for pop-up or large trailers, then an Eaz-Lift 48830 pair is the best choice. These jacks give your camper base that is very stable. They can provide stability to a load of up to 7500 lbs. Their maximum rise is 24 inches and a storage height of 4 inches which makes their storage easy with this manageable height. It has a scissor jack socket. Made out of a heavy-duty material. It cannot work for camper trailers that are small. Pin holding washer is not strong enough. The center lifting mechanism requires a socket or a wrench which you purchase separately. It may be an added cost, but its advantages will be more than what you spend for its purchase. The wrench makes reaching for the rear and front parts of your bike secure. When using it, you do not have to go around your bike to get to each part, and it without effort rotates them to your position. The platform measurements are 15×9 inches which are reasonably big to hold large loads. The rubber mat is incorporated to prevent it from getting scratches and prevent loads from slipping. It goes down to storage height of 3.5 inches, making it possible to move around with it on your bike. It has a central lifting design. Its platform is wide and has a rubber mat. Cannot be used for trikes. The choice for the best scissor jack requires one to be very careful. They are available in many types that may be similar, but they are designed to function differently. There are many considerations to make before purchasing one to make sure you get the best for your intended purpose as well as the duration. Below are some of these factors. Make material: – The material used to create a scissor jack always has a significant effect on its performance. The standard materials recommended are aluminum and steel. Steel knobs are cheap and function very well hence are readily available while aluminum jacks are quite expensive in comparison to steel ones. The performance of these materials is, but there are specific considerations for each. One is the amount of money that you are willing to spend on your tool. Steel is cheaper than aluminum. The weight and size of your car is another primary consideration. A steel jack can accommodate small and light vehicles, but big and heavy vehicles like trucks a steel jack would be the best option. Clearance height: – Clearance height is the height of a standing scissor jack before it starts working, which should be put into consideration when making a purchase. Remember that the jack has to go beneath your car to start working. The distance from the ground to a vehicle is not the same for all hence buy one that will fit underneath your car appropriately. Adjustability: – This factor makes sure that operation goes on slowly. Your jack should move your load up and down smoothly. The best scissor jacks come with a switch that controls its movement. It does not require manual force to operate. Lifting capacity: – Capacity denotation is in tons. Before purchasing any jack, ensure that it can handle the weight of your vehicle. The more the lifting capacity of a jack vaunts, the better it is from the rest. Each jack comes with its limited lifting capacity. Also, mark that it is not the whole weight of the car to be lifted so the jack should have a considerate ability to lifting. If you want one that can raise the car as a whole, then buy one that can accommodate it accordingly. For a fact, the size and weight of your vehicle will determine your choice of a jack. Lifting height: – Lifting height is the maximum height that a jack can lift a car. It has to be one the user can comfortably use to work. A short lift will have the user work while bending causing too much discomfort. The ideal range of lift is between 18-20 inches, an important characteristic that should not be ignored to avoid disappointment. Lifting speed: – The best speed for a jack is the highest possible. No one is prepared to raise their car up inch by inch. A slow jack will take much time than was intended. A fast speed jack will ensure that you stay on time. Even in the case of a puncture, you will not have to stop your journey because your jack has refused to cooperate with the urgent need at hand. At the time of purchase, make sure you test the speed as that is the only way to be sure that it is what you want. Again, you can get information from other users on the best choice to try the best. Size of the base: – The feature to look for here is how broad the support is. It determines the stability of your jack and the load on it even when placed on a smooth surface. The wider the base, the better the balance of your jack. The price: – The cost of a jack should give you an idea of how good it is. Cheap always gets to be expensive at the end of the day, so it is better to buy it at a high cost and enjoy its service. The same case applies to a jack, if you want one that will serve you the best and for as long as you want it to, you will have to spend a lot more than you expected. However, do not pay too much, be reasonable on the amount to spend. Always ensure that you are using the right jack for a specific job. Never by any chance work under a vehicle whose only support is a scissor jack. Use support stands if you have to work under a car. Ensure that the jack is placed on the car’s jacking point correctly before you start working. Make sure that the wheels remaining on the ground are always chocked. In the case of a flat tire, drive the car to a place onto a flat surface. For cars with automatic transmission, put it in “park”, then set the parking brake on. With a manual transmission car, put it in first gear then put the parking brake on. Ensure that everyone gets out of the car. Place a brick or a wooden block in front and behind the wheel that’s across the faulty tire. Get your scissor jack, crank and spare tire from the trunk. Screw in the jack handle then proceed to work on the flat tire. Unless you are an expert, use your manual to locate the jacking point on your car. It usually is a reinforced part of the vehicle that can support the weight of your car efficiently as you jack it up. Once located, place your scissor jack underneath your car with it wide part top and facing tour direction. Raise the jack to your desired height as you watch its position as it approaches the jacking point of the car. Be sure to fit it firmly and securely to stay clear of an accident. Ensure that your vehicle is a distance off the ground for a humble working space. At this point, go ahead and change your tire then take your scissor jack back to the trunk. Safely proceed with your journey. A scissor jack is a critical tool that every car owner should have. It is almost a requirement if you have to own a car or generally an automobile. For each vehicle, it is recommended that it has a scissor jack. You never know when you will need it. The best scissor jacks have then had very high demand. This demand has resulted in many fake manufacturers bringing up their tools. The need for this review is to help a buyer choose the best regarding quality and originality. When choosing a scissor jack, go that which will fit your need. If your car is big, ensure that the scissor jack that you use can handle it effectively. Again, before you beginning working, service your tool to make sure that you do not fall a victim of ignorance and cause an accident that could have earlier been prevented. Check for greasing of the elbows to stay clear of manual energy, confirm that all of the parts of the scissor jack are in their right condition and take your time to mount your vehicle. You do not want to watch your car get damaged if it falls off from the jack. You are also not ready to get hurt because you were in a hurry to solve your problem. Always ensure that your scissor jack is the best! Lance is a retired Franchisor, Business Consultant, Philanthropist and I run a Think Tank, as well as do a lot of Traveling, Writing, Cycling, Flying, Volunteering & enjoy life to the fullest. He is the founder of Carwashguys.com. He has vast experience in the automotive field. Sharing his knowledge to help us all is another significant contribution of him to the community. Riders Path is a participant of the Amazon Services LLC Associates Program, an affiliate advertising program which is designed to provide an aid for the websites in earning an advertisement fees by means of advertising and linking to Amazon products.